Two singularly Jewish art forms are the shivviti plaques for synagogue or home and micrographic illustrations. The name for the former is taken from the opening word in Hebrew of the verse, "I have set the Lord always before me" (Psalms, 16:8). Most often these were set before the precentor's stand in the synagogue. 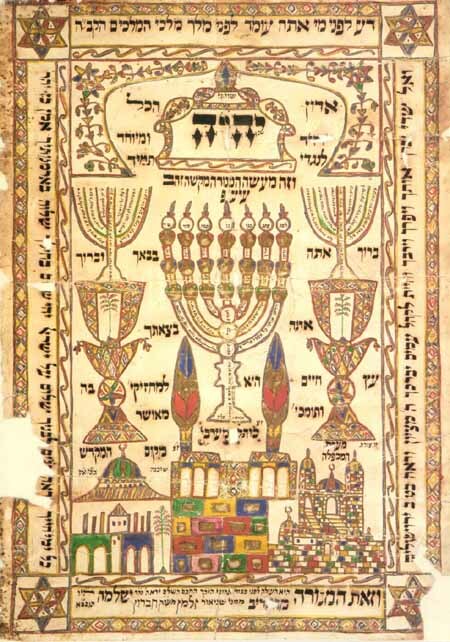 Generally profusely decorated and illuminated with verses forming a menorah, the seven-branched temple candelabrum, they frequently contained artfully formed verses pertaining to prayer. For home use, they were hung as amulets on a wall near the entrance of the house. These contained biblical verses, liturgical formulas, mystical incantations, and kabbalistic symbols. Especially esteemed were shivviti plaques made in the Holy Land, featuring drawings of sacred sites. A gaudily colored shivviti for the home is called a menorah by its artist-scribe, since it features three menorot (candelabra) and is intended for the home, as indicated by the inscription, "Blessed be you when you come in, and blessed be you in your going out." At the four comers are six-pointed Stars of David, enclosing six-petalled flowers. on the top border is the inscription, "Know before whom you stand, before the King of Kings, the Holy Blessed One." Below, flanking a cartouche containing the name of the Lord, is the inscription, "I have set the Master of All, Single and Solitary [God], before me always." Beneath are three menorot, one large and knopped-the temple candelabrum-flanked by two smaller ones standing on double-cupped beakers. In the menorah stems are verses from the Psalms and the liturgy. Below is the inscription, "It is a tree of life to those who hold it, and all who uphold it are rendered happy." At the bottom are depictions of three holy sites: in the center, the Western Wall; on one side, the Cave of Machpelah, and on the other, the Place of the Holy Temple. In the side panels are blessings for peace made up of citations from the Psalms. Shivviti plaques, generally decorated with biblical verses forming a menorah (seven-branch candelabrum), were used in the synagogue and home; in the former, hung before the precentor's stand, in the latter, as a religious wall hanging denoting that one is always aware of the Lord's presence. This colorful artistically executed one was made by the itinerant charity emissary from Hebron, Shneur Zalman Mendelowitz, and presented to Solomon ---, a tear in the paper obliterates the rest of the name, Shivviti Plaque, late nineteenth century, Hebraic Section, Library of Congress Photo). In the bottom border panel is the artist's dedication: "This Menorah rises before my honored and cherished friend, a man full of wisdom, fearing the Lord, Solomon [a tear in paper ... ] from me, Shneur Zalman, from the Holy City of Hebron, may she be restored and rebuilt, soon in our time." Shneur Zalman Mendelowitz was a member of the Habad hassidic community in Hebron, in the nineteenth century. He spent most of his life traveling as far west as England and as far east as India, as an emissary of his community to gather funds for the support of its members and its institutions. These were long, often dangerous journeys in small ships on stormy seas to lands infested by brigands. Once, after three and a half years away from home, his community and his own family urged him to continue on, for the sums he had sent them were not sufficient. At home, he published a number of books, the most valuable of which is Zichron Yerushalayim (Jerusalem, 1876), descriptive of the Holy Land at that time. In it are detailed reports of synagogues, academies of learning, charitable institutions and various social organizations, as well as legends. In the second part Mendelowitz writes about the cities he visited during his travels, among them Damascus, Aleppo, Baghdad, Basra, Bombay, Calcutta, Cairo, Alexandria, Izmir, Adrianople, Constantinople, Kremenchug (Russia), London, Paris, Amsterdam, Frankfurt am Main, Hamburg, Berlin, and Halberstadt. He mentions the names of those who helped him in his charitable mission and those who extended him hospitality. Micrography is the forming of pictures of persons or objects with the words in tiny letters of verses appropriate to the subject. Thus the story of Jonah, the reluctant prophet, the boat, the fish, the ocean are all formed from the words of the biblical book bearing his name. 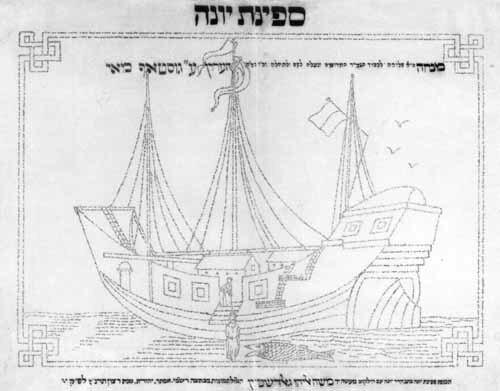 it was fashioned by Moses Elijah Goldstein in 1897 and presented to Herr Gustave May, ("The Ship of Jonah," Micrography, 1897, Hebraic Section, Library of Congress Photo). His chief benefactors were members of the Sassoon family in the Near East and in Europe, who provided the funds for building two Habad synagogues in Hebron. In appreciation Mendelowitz presented to Solomon Sassoon an illustrated menorah tablet similar to the one in the Library of Congress. We know of no other of his artistic works which have survived. This peripatetic emissary, author, and artistic scribe used his talents to promote his mission, distributing his published works and rewarding philanthropists with the fruits of his scribal artistry. The Library's shivviti menorah tablet is just such a gift presented to a Solomon, whose last name is lost. ("Portrait of Moise," Micrography, late nineteenth century, Hebraic Section, Library of Congress Photo). Lovely micrographic drawings of "The Ship of Jonah" by Moses Elijah Goldstein, and Hillel Braverman's "Portrait of Moise" represent the Library's holdings in this art form. Micrography draws a design, portrait, or scene associated with the subject by using words composed of tiny letters, whose forms are barely legible to the naked eye. 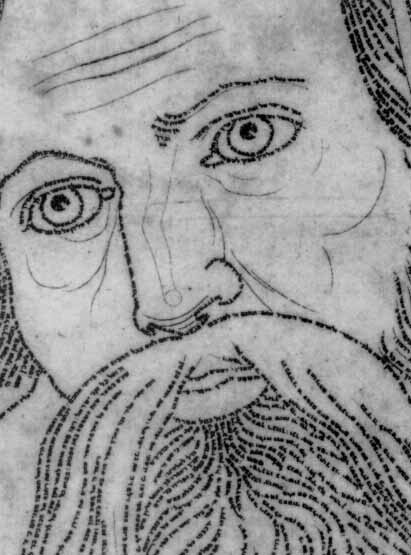 Widely used in medieval Hebrew manuscripts, micrography experienced a revival at the end of the nineteenth and the beginning of the twentieth century. 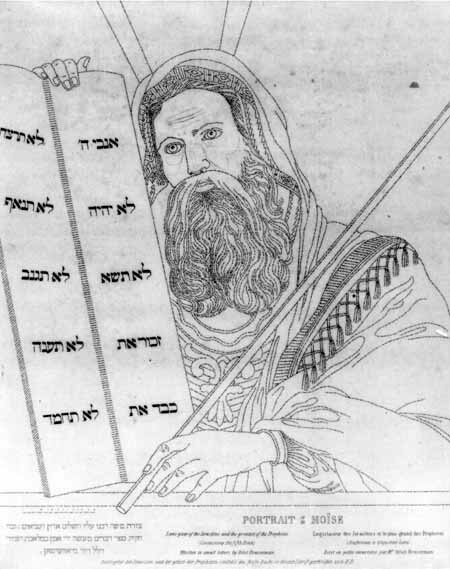 It has been esteemed by Jews, because it makes it possible to draw a picture of a sacred event without "casting away" the sacred words which describe it in a classical religious text; thus, micrography permits the welding together of the visage of a saint or sage with the very words he uttered or which were written in praise of him. "The Ship of Jonah," completed in 1881, was presented to "the exalted and notable philanthropist, Herr Gustave May," in 189 7 by the artist, who had already published micrographic portraits of Simeon bar Yohai, Esther, and Judith. The ship depicted is a galleon, Jonah has just been cast from it, and a fish no larger than he swims toward him, mouth open to swallow him. The reader, magnifying glass in hand, can follow the story of the prophet who was reluctant to heed God's injunction to preach repentance to the feared and hated city of Nineveh; and having been taught by God that He is the father of all, Jonah accedes and thereby becomes Nineveh's savior. This message of God's loving concern for all humankind has been incorporated into the Day of Atonement liturgy when the entire book of Jonah is read at the afternoon service.